What Cloud Is The Best Fit For Your Business? The cloud is an overarching term for the shift from complete on-premise computing and data storage to utilizing off-site providers for computing, applications, web hosting, and data store. Although seemingly ubiquitous “the cloud” and “cloud computing” have many different definitions. Businesses can create cloud-like environments within their own companies without having to go to outside providers through a process known as virtualization. However, “the cloud” and “cloud-like” are two different beasts. In order to better understand the different types of cloud configurations, we have outlined the three major types of cloud computing. Which scenario works best for your business depends on your organization’s specific needs and goals. Back in the late 2000’s when cloud computing was an up-and-coming buzzword, many IT companies and publications referenced cloud computing as a “public cloud.” With this form of cloud computing, companies select an off-site third party provider for computing services and data storage. The reason this set-up was called a "public cloud" is because multiple clients would be hosted on the same server by the off-site cloud provider. Data, computing, and other processes were not dedicated to one specific customer, but rather the resources were shared by many different companies. As the cloud has evolved over the years, most cloud providers refer to the “public cloud” as simply “the cloud.” Cloud providers are now able to offer dedicated virtual private clouds that segment different clients onto virtualized servers running on the cloud provider’s infrastructure. These dedicated virtual private clouds provider their clients with complete isolation and protection of their data, providing protection against outside intruders and from having customers share the same infrastructure. With a public cloud set-up, the cloud provider is responsible for monitoring, maintaining, and ensuring that a company’s data and computing resources are available 99.99% of the time, reducing staffing and other costs associated with having to manage hardware in-house. 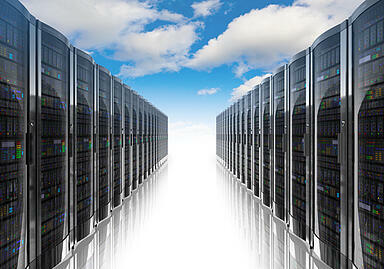 A private cloud is essentially a cloud-like environment built inside a company by virtualizing physical servers. With a private cloud, physical servers are virtualized so that multiple virtual servers operate on one physical piece of hardware. This allows organizations to optimize their hardware and resources by eliminating the need to have racks of multiple physical servers, and instead consolidating them as virtualized servers running on one server rack. With this set-up, businesses are able to keep complete control over their data as it operates on the company’s network, while staying protected behind the organization’s firewall(s). The downside to the private cloud is although it optimizes hardware use, it still requires in-house maintenance, and after the physical server has been maxed out through virtualization, scaling upward requires the purchase of new servers to meet demand. Many businesses these days operate under what is known as a “hybrid cloud.” Companies use cloud computing providers such as Amazon Web Services for cost-effective, enterprise level computing power and scalable data storage solutions. At the same time, they virtualize their physical servers in-house and are able to keep highly sensitive data inside the organization on the virtualized physical servers, protected by the company’s firewall. So essentially they get the best of both world – they can leverage the cost saving options, scalability, flexibility, and power of the cloud while also maintaining complete control over sensitive data on their own physical servers. Connections between the private cloud and the cloud (public cloud) can be secured through virtual private networks (VPN) or services such as AWS Direct Connection, bridging the gap between the private and the public cloud.